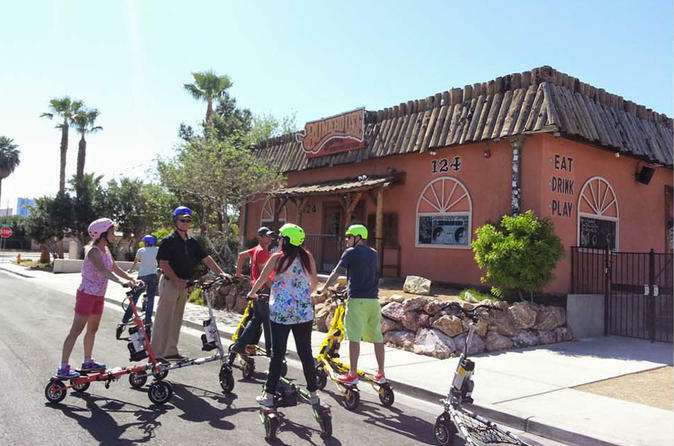 Sail through Las Vegas' local streets and neighborhoods on a trikke during this 1-hour guided tour. The scooter-like vehicle allows you to cover much more ground than you would on foot during this insider's tour of the Fremont East district, including parts of town that many travelers don't visit. Make your way to the Trikke Las Vegas Kiosk, located in Container Park. Get a brief orientation and lesson on how to operate the trikke, then don your provided helmet and sail off through the shopping park made entirely of shipping containers. Spend the next hour scooting through the Fremont East district, a neighborhood bustling with new development and home to lots of hip restaurants, bars, and other attractions. Through your provided headset, listen to your guide talk about the area's history and development into a popular place for locals to hang out. Enjoy getting to know an area that not many travelers visit and learning a new sport.